Summary: This walk begins in Sicklinghall and heads north east through Stockeld Park before crossing the Harrogate to Wetherby road and continuing to join the Harland Way which follows the course of a disused railway to Wetherby. 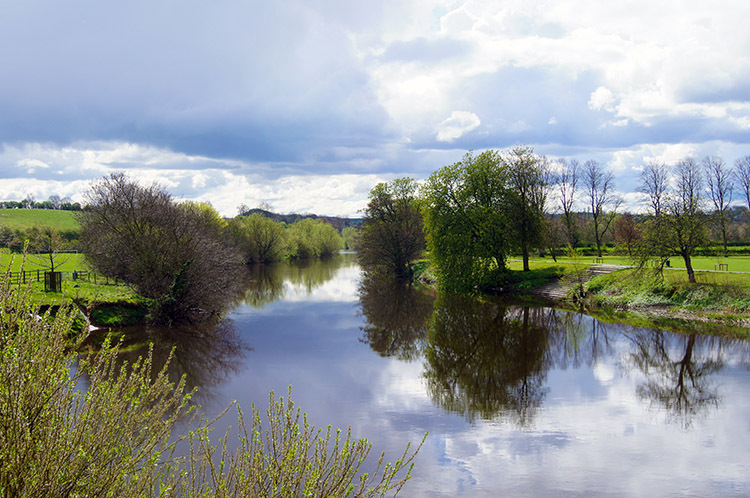 From the town the walk follows the River Wharfe upstream before cutting off through the town golf course to Linton and then follows a bridleway road and fields to Lime Kiln Wood and then to Sicklinghall House and back to the village. 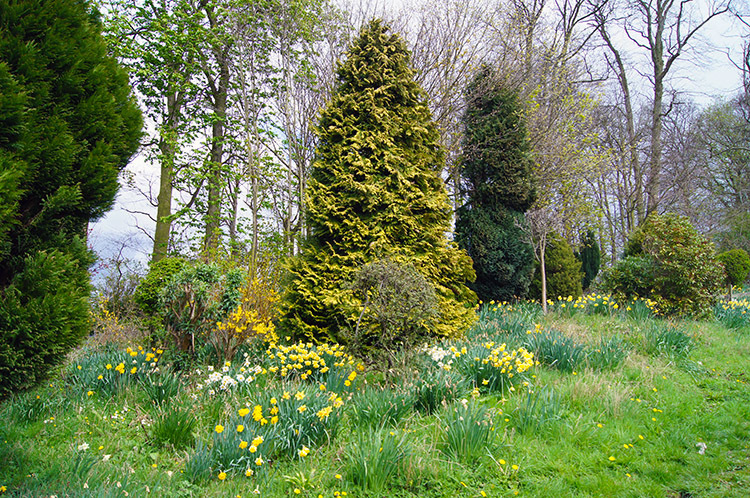 Having no plans for the day, walking up to a lovely spring morning prompted me to do a walk. Obligations and time did not allow me to travel far so the Yorkshire Dales and North York Moors were out of the question. 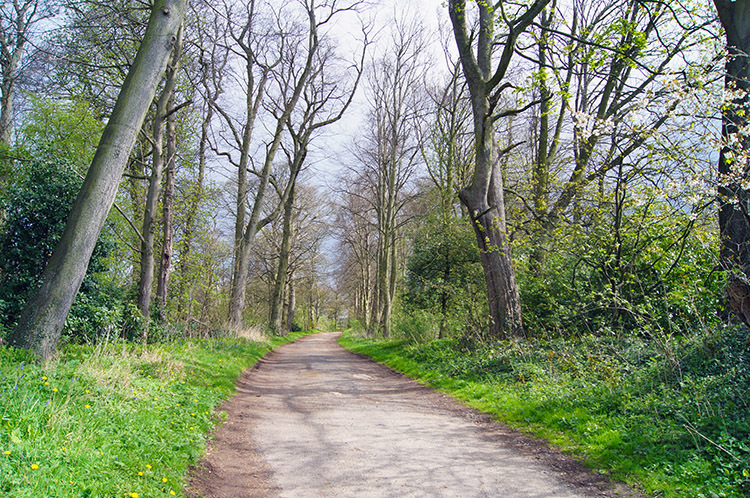 Where could I go local to my home in Harrogate to find paths and trails I had not explored before? The answer came to me quickly, I had missed out on a circuit centered around Wetherby for too long. On first look at the map I scanned Wetherby and the east towards Thorpe Arch but couldn't find a suitable circuit for the four hour window I had. Looking at the map a circuit to the west of Wetherby stood out and with route determined I put on my walking gear, got in the car and drove to the village of Sicklinghall to start the walk. The sun shone brightly to accompany my short car journey. 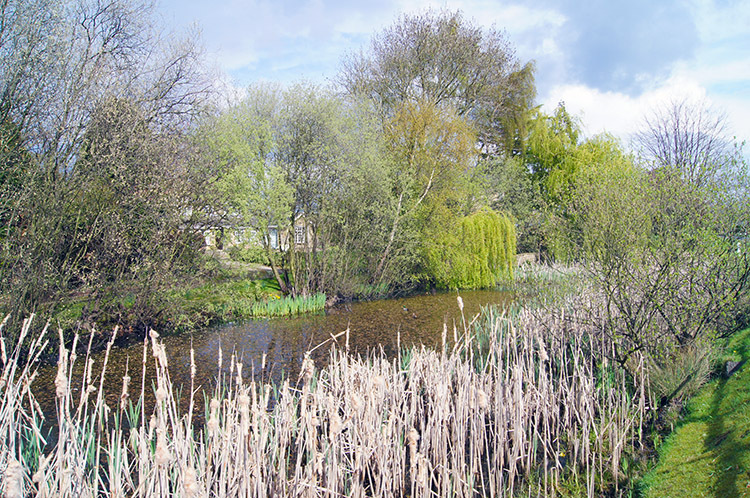 Once parked on a side road in the village I set off from near the village pond, a beautiful sight with Bullrush and pond weed in the clear water and with Hawthorn, Cherry and Willow fringing the pond edge. 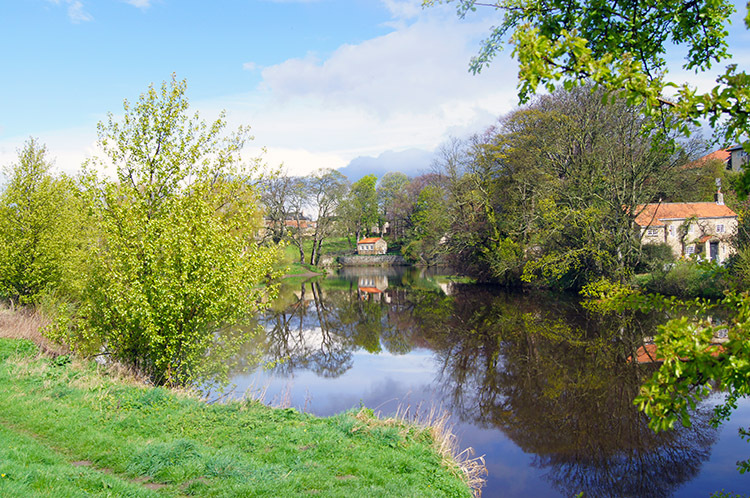 From the pond I followed Stockeld Lane toward Stockeld Park. I love walking in early Spring. 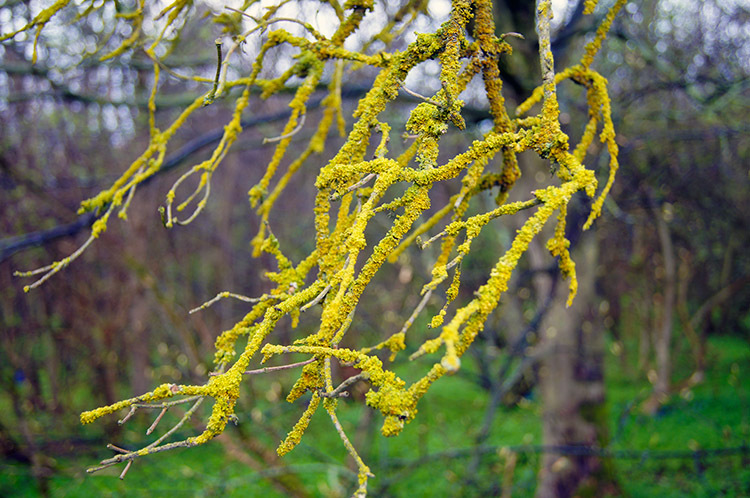 It is my favourite part of the year with hedgerows turning a youthful green, trees displaying blossom with different ranges of colour and all of them uplifting the spirits. On the ground grass is starting to grow again and spring flowers like the blossoming trees reveal their vivid array of bright colour too. 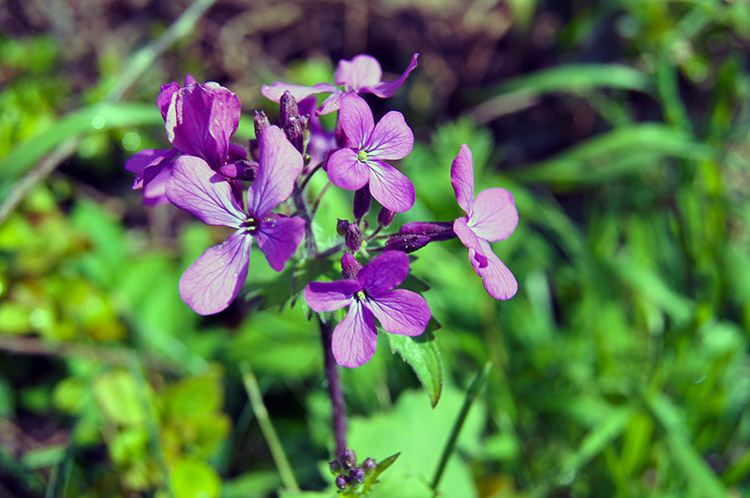 I walked on feeling very lucky indeed and by looking intensely at all the flora around I had ambled through Stockeld Park without noticing and most definitely without concentrating. I had to concentrate to safely cross the A661 Harrogate to Wetherby Road. 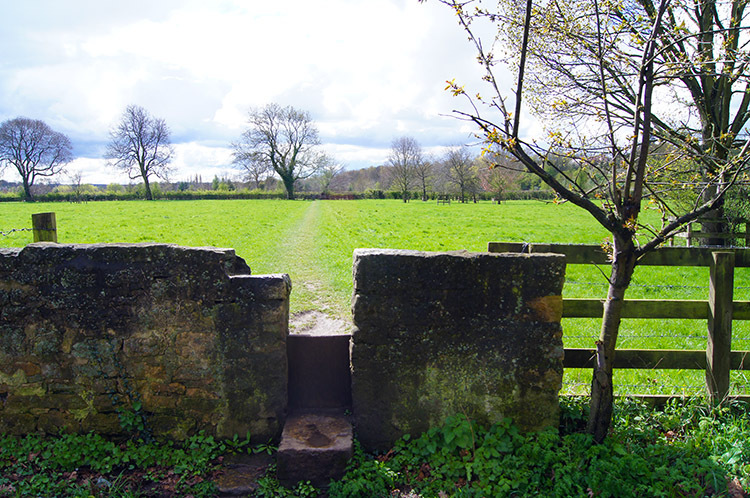 From the road crossing I walked through Stockeld Grange Farm to join the Harland Way. As I crossed the field between the farm and the Harland Way the sun popped in behind thick cloud and a prolonged April shower began. 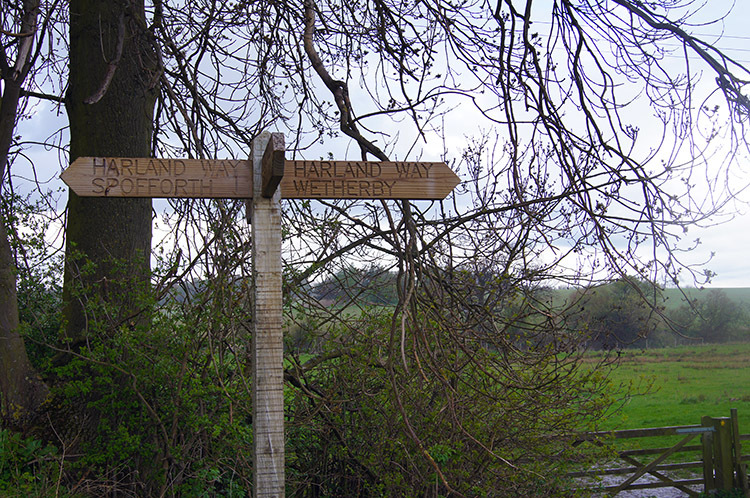 I had not been aware of the Harland Way before today and it was a wonderful surprise. It follows the course of the dismantled railway line which used to facilitate trains between Harrogate and Church Fenton. 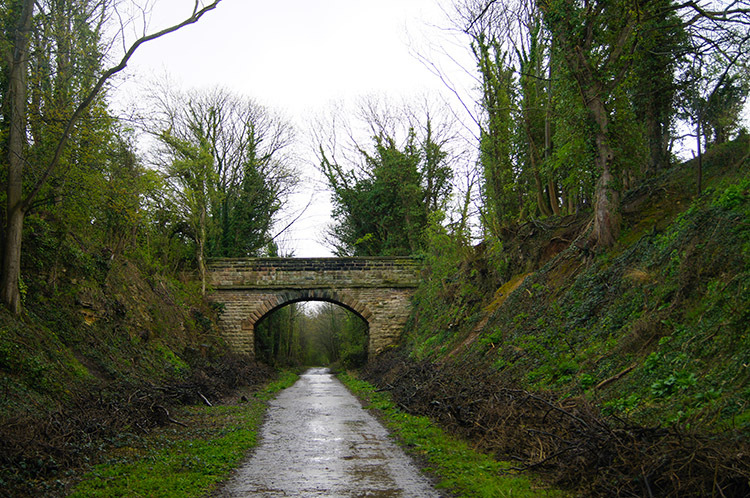 The line operated from 1848 until it was closed as part of the Beeching cuts in 1964. 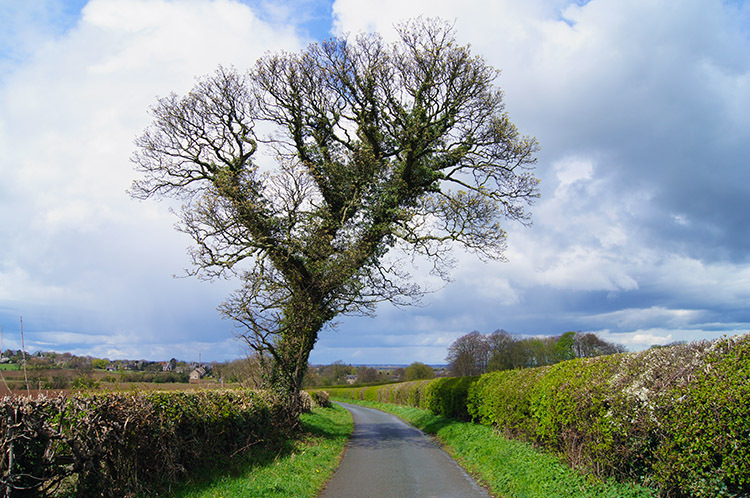 It provides an excellent cycle and walking track between the village of Spofforth and Wetherby. I did not walk along it immediately on reaching it, instead crouching under Hawthorn trees to avoid the worse of the rain storm. As I stood it out I watched a number of cyclists pass, all being families with parents encouraging their younger charges on. 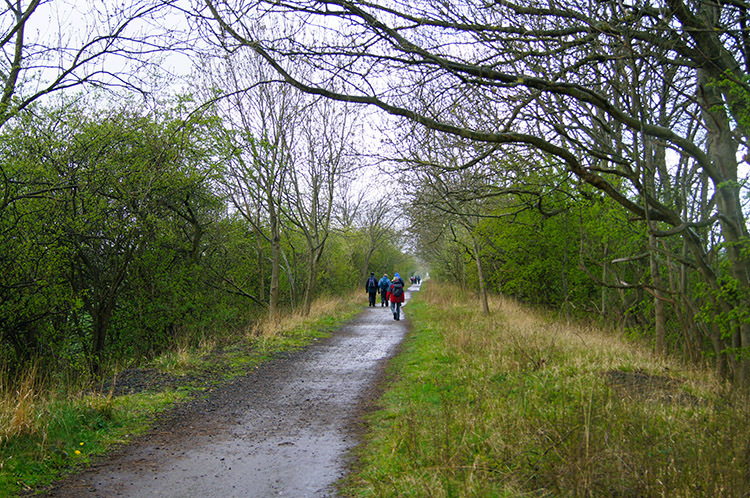 There were lots of learner riders on the Harland Way. There was also a large group of ramblers too whom I passed and some of whom I greeted on the resumption of my walking. 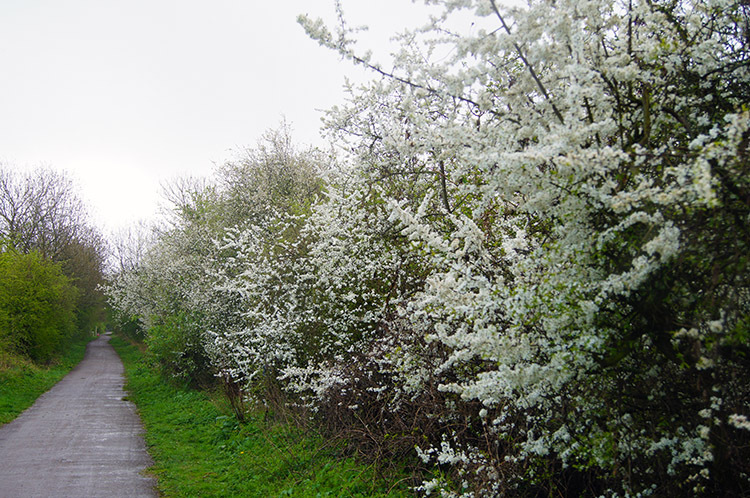 I continued on Harland Way toward Wetherby following the line of the old railway track, passing under two bridges and walking past banks of Hawthorn in bright white blossom. A delightful railway journey it was. In parts of the walk along the line it was clear to see the toil expended by the labourers employed on the line in digging out deep cuttings to keep the track on the level. Eventually I reached Wetherby, the end of my walk on this particular line. 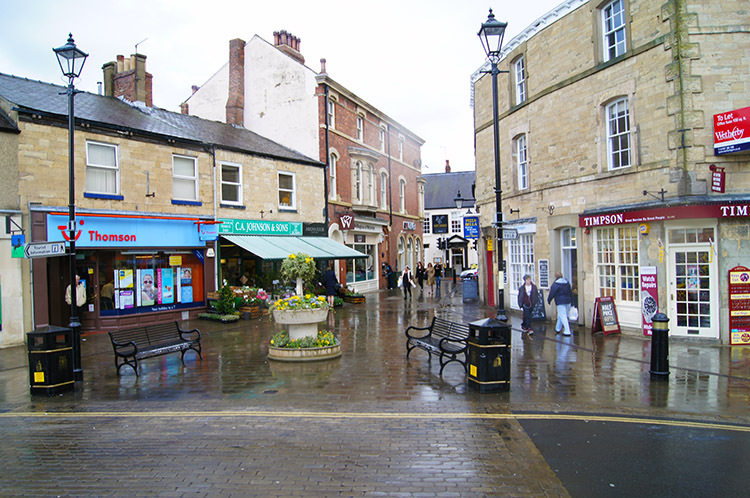 The extended rain shower had stopped by the time I left the Harland Way and walked into Wetherby. I emerged from the track I took from the Harland Way at the quirky building which houses Wetherby Cinema. Many provincial towns have ceased to operate a cinema. 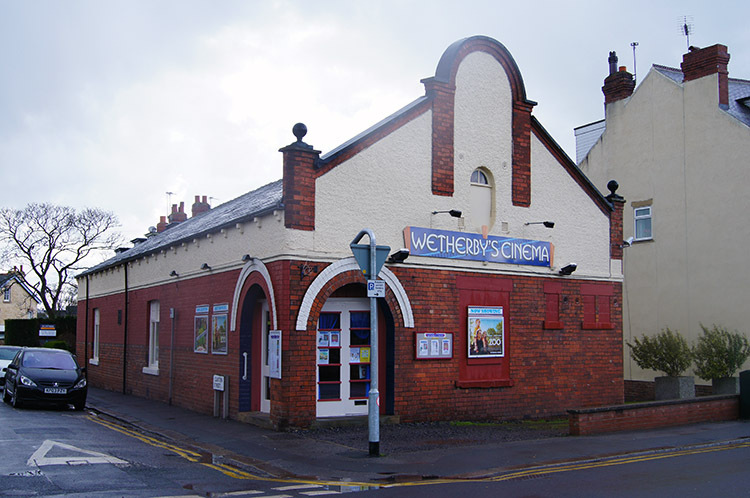 Wetherby's survives, Matt Damon was headlining. From the cinema I walked on footpaths to the town centre. I paused at Wetherby Town all where a commemorative plaque told me that the building was erected in 1845. Turning round 90 degrees to my left I read a commemorative stone on the Market Hall telling me the frontage had been erected by public conscription in 1911 to celebrate the coronation of King George V. As I looked up I could see blue sky through the cloud. 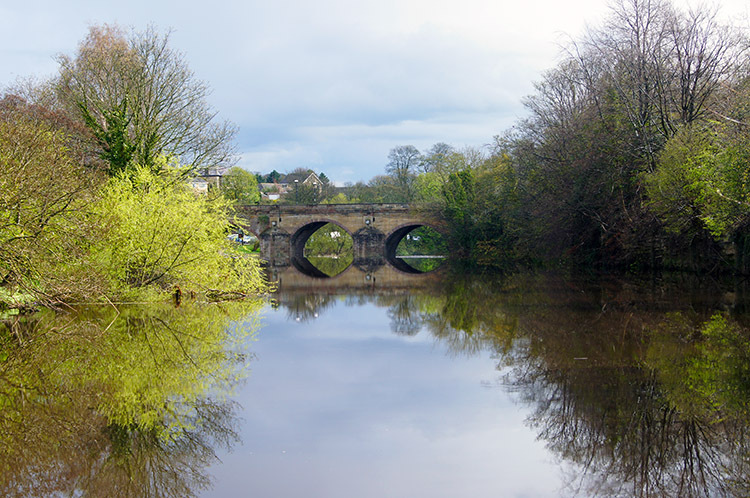 I left the centre of Wetherby by walking over the town bridge and heading towards Wetherby Ings. I was seeing for the first time what I had imagined for years. Many, many times I have crossed the bridge by car with the walls on either side just too high to allow a view of the river. Now the mystery was solved, I will no longer have to imagine, from now when in the car I can visualise. 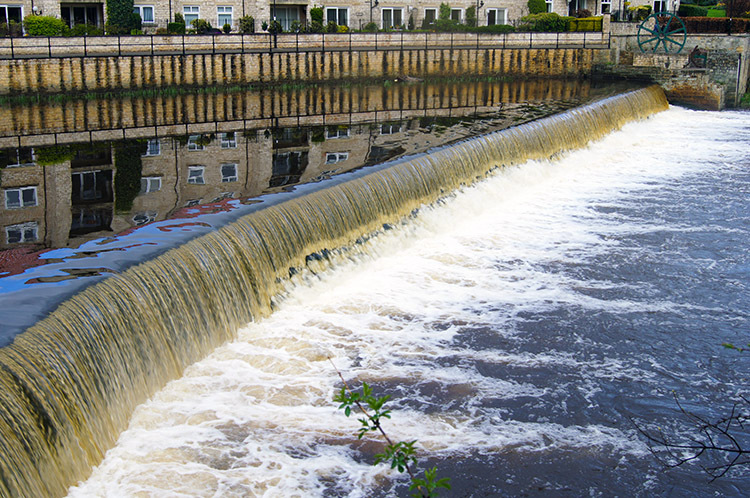 The highlight of the view was a weir cross the river on the upstream south side. I walked to the rivers edge by the weir and after watching for a while I continued on toward Wetherby Ings. Further upstream from the weir I walked to the waters edge and looked back again toward the bridge. The water seemed so still creating a perfect reflection. Wetherby Ings was beautiful. It helped with the sun being out in force again, warming the scene and bringing out the full colour available. I enjoyed strolling around the waters edge in quiet contemplation until I was abruptly interrupted. Just after I had taken a photograph I was hit by something from above. At first I thought a slight breeze had blown blossom from a nearly tree onto me. I soon found out to my horror it was not so, a passing bird had deposited its lunch on me. My camera was covered in a huge dollop and my jacket was spattered with white. The cheeky bird, there were lots of Blackbirds around, I reckon it was one of them having a bit of fun at my expense. I though "Oh well. that's the experience of nature at its most natural" and returned to my enjoyment of the gorgeous scenery. I left Wetherby Ings and left the side of the River Wharfe by crossing a footbridge and walking across a playing field and then a pasture to track on a footpath across Wetherby Golf Course. A group of golfers waved me over the fairway of one hole which took me toward the Wetherby to Linton road. 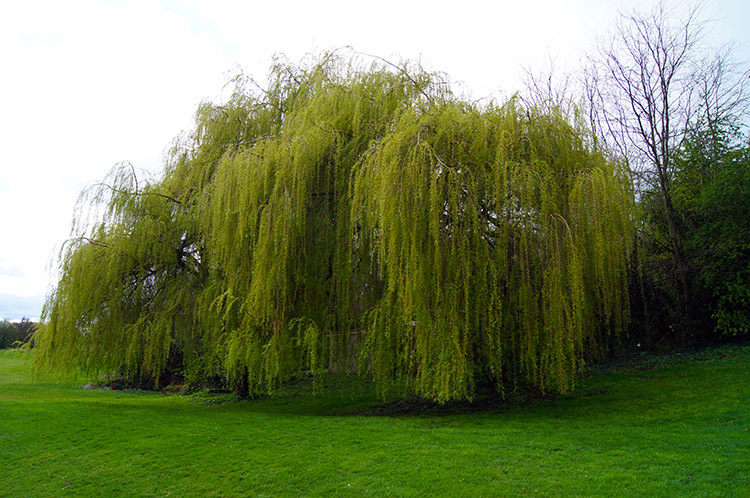 Just before I climbed a bank to the road I passed by a lovely mature Willow tree. I walked along the roadside to Linton in sunshine but as I neared the village I could see another belt of rain approaching. 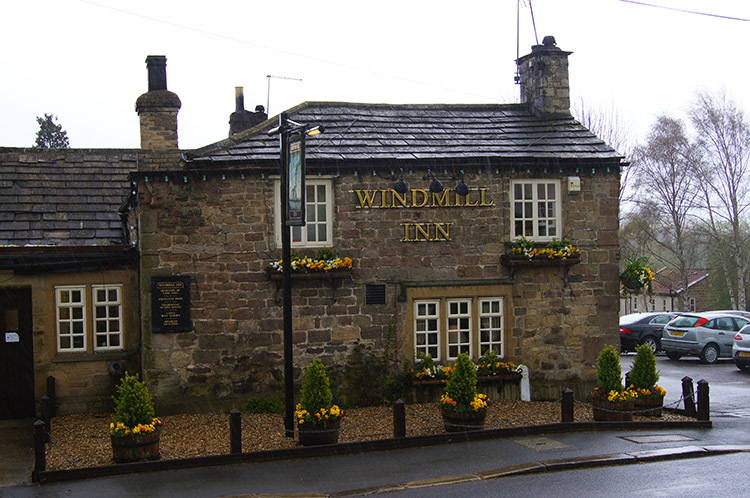 I reached the village in sunshine but by the time I reached the village pub the rain was falling. It fell all the time I walked on Trip Road toward Woodhall Hotel. It stopped as I left the road. From Trip Road I followed a path across a field of sticky mud which became improved walking as I followed the path by the side of Lime Kiln Wood. In the woodland I looked at a magnificent carpet of Bluebells, catching my attention so much that the wood side walk seemed shorter than it actually was. 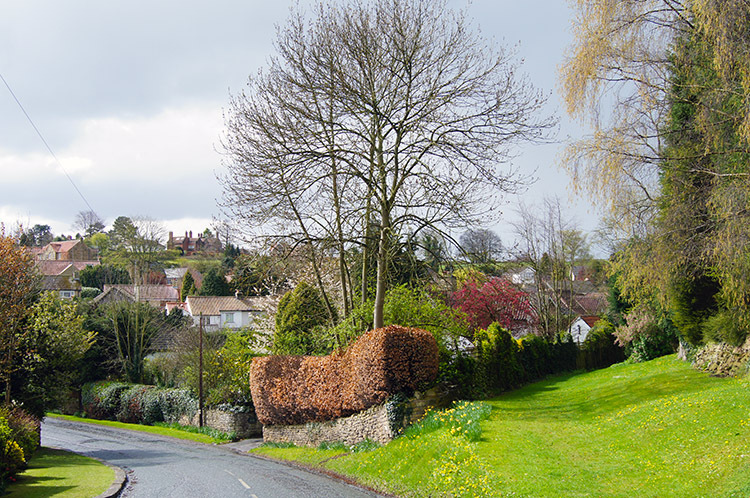 Bright sunshine broke out again to accompany me on the final section of the walk past Sicklinghall House and along Longlands Lane back to the village. All mud accumulated on the sticky field crossing and wet captured on my trousers during the woodland section dried as I walked the final mile so despite the showers during the walk I arrived at the finish as dry as when I had set off. I walked back through the village in the high spirits I had enjoyed throughout the great walk I had just done. 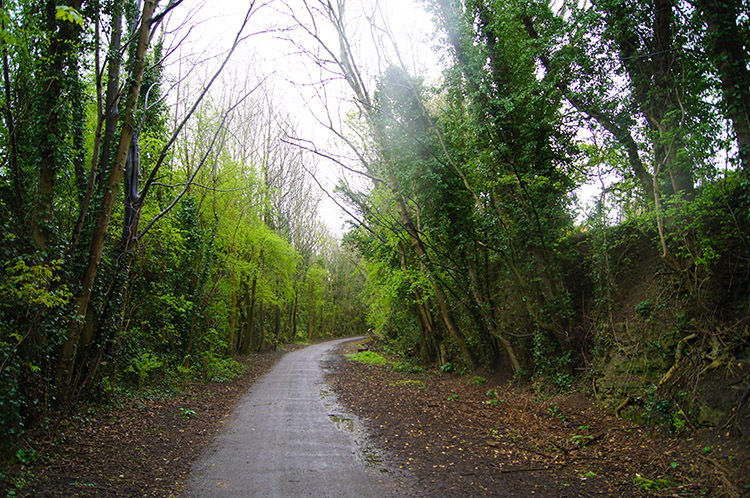 All the way had been such a thrill with the Harland Way along the old railway track a particular highlight. Wetherby Ings had been a brilliant section. 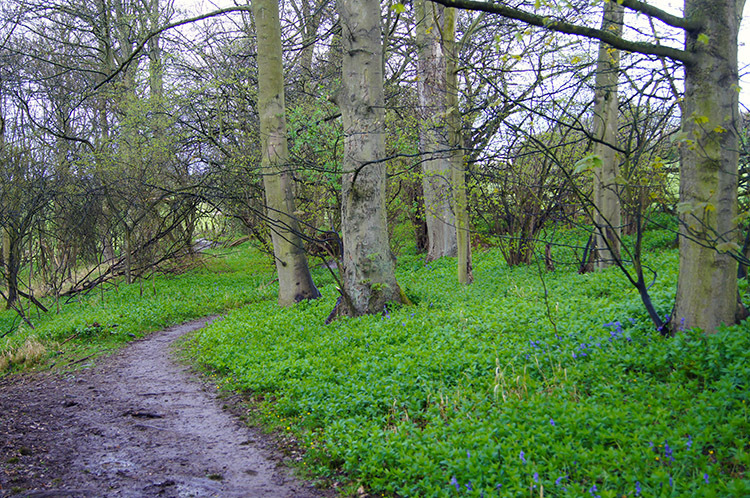 Lime Kiln Wood must be visited when the Bluebell carpet is at its best. A wonderful walk indeed.